When it comes to jewelry, not many consider how a piece came to be. This is not to say that people don’t love jewelry, but they simply do not know much about the process. Well, that is starting to change as technology is revolutionizing what is possible with jewelry design through things like CAD or computer aided design software. The power to design a personal and highly specific piece has never been in the hands of the consumer in this way before, which will likely make consumers more knowledgeable about design. Most of the jewelry designs you’ve seen started with conventional tools and techniques. Most designers begin their design with a pen, designing the piece like it has been done for ages. Once the design is properly drawn, the craftsperson makes the model out of wax, which is then encased in plaster before it is heated up in a conventional oven. Yes, this process takes a while, which is part of the reason designing a personalized piece comes with a hefty price. The craftsperson has to wait until the model is hard enough to be able to continue with the design process. The next step is to turn the metal that is going to be used into its molten form, which is simply poured over the mold. Of course, the designer now has to wait for the metal to cool off before breaking the mold. The designer, usually a very talented person, will now polish the design to make it presentable to the customer. 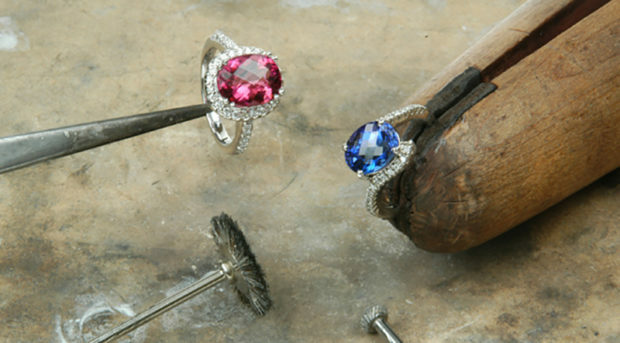 It is not an easy process, but it is the one jewelers have been relying on for a long time. Still, it was inevitable that this process was going to undergo some changes, which jewelry lovers out there are going to love. More people are starting to notice sites like DiamondStuds.com that offer customers the opportunity to customize their jewelry pieces. This is part of an ongoing trend that is allowing regular folks to design their own pieces, thanks to technology. As mentioned earlier, designing a custom jewelry piece takes a lot of work, which is why only rich people could even consider it, but that is no longer the case. CAD software has been replacing hand designing all over the industry, which makes it easier for jewelers to design variations on an existing design or change themes when needed. This software allows designs to be accessed by other artists, which allows them to design something new using the same foundation. In essence, this means customers get to see more diversity in design simply because it is easier now. It should be pointed out that this software also allows designers to get an image of what the final result might look like. It is very easy to think that a particular design is going to look good after it is complete even though it might not, which can waste time. CAD helps eliminate that wasted time and gives designers an opportunity to fix mistakes before actually completing the jewel piece. CAM machine software or computer aided manufacturing is also changing the game in a number of ways using 3D printing technology. As you know, modification to a design meant that you had to go back to scratch and create a new wax mold, but designers can bypass that now. 3D printers give designers the chance to make changes to any design and simply print the resin prototype afterwards. This cuts processing time and ensures that the final piece is in the customers hands rather quickly. Laser sintering should also be pointed out because it helps designers create workable hinges and pins without much effort as long as powdered metals are used. This laser technology gives designers the power to melt metals in layers, which means that shaping a metal is not only easier but more precise. These changes in technology are propeling custom jewelry into the mainstream, which is great for everyone because all jewelry lovers deserve to have a unique piece.